Using laser pulses that last just 70 femtoseconds (quadrillionths of a second), physicists have observed in greater detail than ever before what happens when atoms collide. 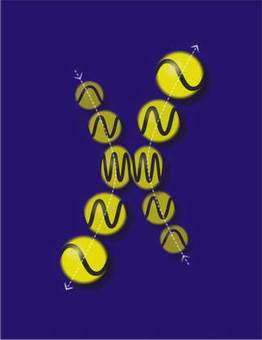 The experiments at JILA, a joint institute of the National Institute of Standards and Technology (NIST) and the University of Colorado at Boulder, confirm a decades-old theory of how atoms--like tennis balls--briefly lose form and energy when they hit something. The results will help scientists study other atomic-scale processes and better understand the laws of physics. The new data, reported in the Oct. 14 issue of Physical Review Letters,* provide the equivalent of missing frames in movies of colliding atoms (see simulated images in accompanying graphic). As is the case when a tennis ball is hit by a racquet, the motion is too quick for the eye but can be detected using short flashes of light. The JILA scientists collected data on atoms' properties before, during and after collisions lasting just half a picosecond (trillionth of a second) using laser "flashes" that were even faster. In the JILA experiments, about 10 quintillion potassium atoms in a dense gas were packed into a titanium container just 1 square centimeter in size and heated to 700 degrees C (almost 1,300 degrees F). With such high temperatures and large numbers of atoms, the experiment is designed to maximize the number of atom collisions. Rapidly alternating pulses of laser light then are used to "freeze frame" the action. Energy from the first laser pulse is absorbed by the atoms, placing them in a uniform state, emitting electromagnetic waves in identical patterns. A second laser then quickly hits the mass of atoms, and a detector captures a signal beam formed by the interaction of the beams. Light from the second pulse is absorbed and re-emitted by atoms that are "in synch" but not by atoms that are colliding and losing energy. The intensity of this signal beam, measured as a function of the delay between the two pulses, provides a "snapshot" of how many atoms are colliding at any one time, as well as details about changes in their wave patterns. *V.O. Lorenz and S.T. Cundiff. 2005. Non-Markovian dynamics in a dense potassium vapor. Physical Review Letters. Oct. 14.